I’ve come to the realization I need more totes. I really only have three totes – a black Smython bag that I got nearly a year ago and have worn constantly, my bright blue Prada, and a stone-colored Cuyana tote that I haven’t seemed to wear as much because the tote lacks structure. Don’t get me wrong, I LOVE my Cuyana pieces (especially this clutch), but I prefer my big bags to have more structure. All of my other handbag styles are pretty small, but during the day, all I want is to grab a big tote to throw everything in on the way out the door! I’ve had my eye on this light oak tote from Tory Burch, but as I had more time to peruse the site, I found so many to love! While I think this particular tote is exactly what I’m looking for (the ideal summer neutral, am I right? ), this tan leather tote is sleek and sophisticated, and would look great all year long. Another pretty neutral piece with a bit of extra flare is this embellished tote. So cute! For those of you dreaming in technicolor, Tory’s got a bunch of bright and beautiful bags for you! 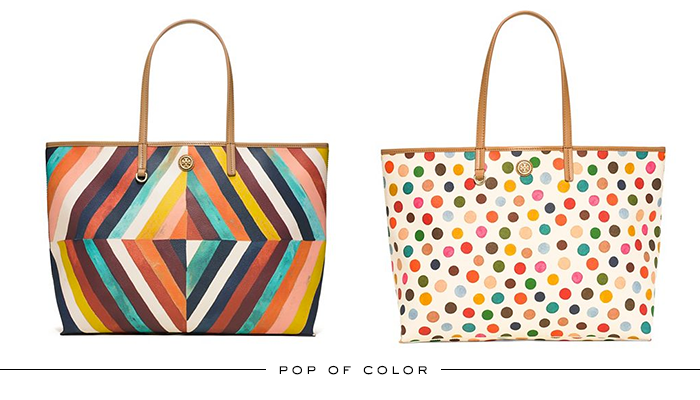 I can’t decide whether I like this polka dot tote or this multi-color stripe tote better. Either one would be a winner from pool time on the weekends to mid-week errands. If solids are more your thing, take a peek at this big yellow tote and this bright red piece. Fab! While I don’t have any beach-specific trips happening anytime soon, I do have a few visits to California coming up this summer! 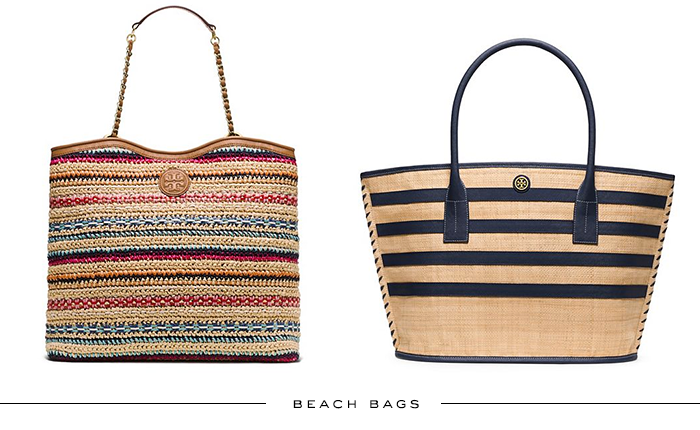 Carmel, Los Angeles and San Diego are on my agenda for May, June and July, and I think it’s the best kind of excuse to pick up a fun new beach tote. I’m leaning towards this one, but this embroidered fish tote is super cute too! This simple striped tote is a winner as well, and comes in red in addition to the navy one you see above. PS – this one will actually fit a beach towel! The perfect size. love the polka dot tote, so perfect for Summer. How sturdy is the Cuyana tote? I know it’s not structured, but is it durable? I was thinking about getting one for work. totes are fabulous. I love the Madewell Transport totes too…if you are looking for other options. The leather wears so nicely and ends up looking sort of vintage. 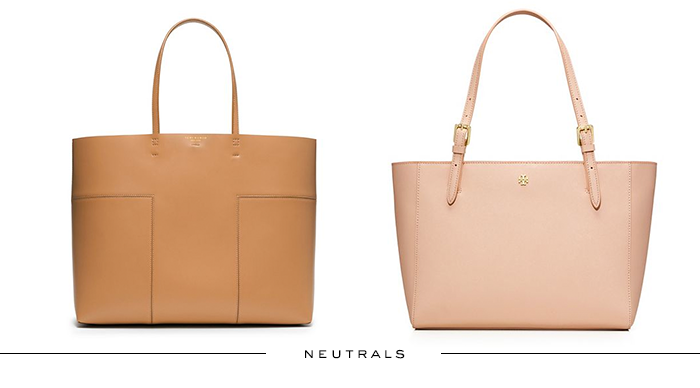 I’m loving that first Tory tote pictured above~perfect structured option. I’ve been so into totes ever since I got into real estate. I carry my life around with me, and totes are the perfect (and stylish) solution! I hadn’t seen those colorful Tory Burch totes until now, and I’m obsessed! So many choices for so many different occasions! I’ve been looking for a summer tote and I love your picks! Obsessed with those polka dot totes! I feel like you can never have too many totes, as I feel like each is for a different occasion and purpose! I agree, the structured totes are ideal for the day-to-day purse, but I quite like a slouchy tote as my beach bag! Great pics, I love the classic navy Tory Burch. I’m obsessed with the navy striped one. I adore a tote, especially since as bloggers/editors we are always having to carry a camera. Love all of these options! So fun!! I’m not a huge tote wearer but I want to change that- they’re so convenient! Again these bags are simply wonderful! I hope i can get neough to get one. I bought the diamond-print one for summer and I’ve worn it almost nonstop. I actually went with the slightly smaller version because I don’t like to haul around too much with me all day. It’s still big enough for all the essentials and then some. upsetting because I LOVE the bag!! I would try taking the bag to your local shoe hospital. I take damaged bags to mine all the time and they have not failed me yet!! Hope that helps.